Is It Lame To Cry Over Dead Fish? Discussion in 'General Discussion' started by Civanna, Apr 10, 2017. 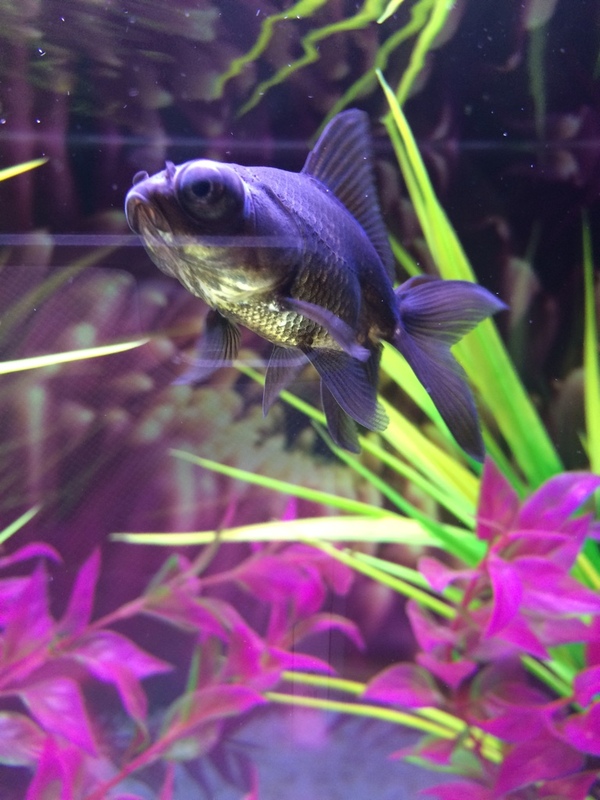 I lost my precious Blackmoor this morning. Never thought that would happen. I've been crying on and off all day! I loved her so much she had her own little personality and I genuinely felt like we bonded! I feel so sad for her and SO guilty! Like pure anxious guilt like I could have done more to save her! I have to try to remember that to her I was nothing but the food master and that whatever bond I thought I felt was probably in my head? I emptied the tank, got rid of all the substrate/plants etc. Will be starting again from the very beginning with a new little Blackmoor family. Anyway, here's my gorgeous girl. No, I don't think it is lame. I cried a bit when I lost my little nerite snail last month. You loved her. Nothing wrong with that. More people should be that compassionate, the world would be a better place. Aww, that's a really lovely thing to say & I never thought of it like that before. Thank you! There's nothing wrong with the way you are feeling. Sorry for you loss. Of course not! So sorry for your loss! Why would you think its lame? Heck, I have done this for 40 years and I still get upset when I lose a fish. Are you kidding me?! I bawled myself sick whenever I lost any of my fish. When my first betta and my bumblebee catfish died (different times) I was a sobbing mess for the day. It was horrible! I know when my big old comet goldy (finally) kicks the bucket I'm gonna be a mess I've had him for 7-8 years. I quite literally scared my dog wailing when I found one of my bettas gone. I think loss is loss. Qualifying it due to "appropriateness" is a fool's game. Heck no!! I've recently started this hobby and I can already tell you that if one of them passes, I will definitely be crying for majority of the day! Especially when you've grown a bond with them, how could you not cry?! I don't know if we're overly passionate or just cry babies, lol! I really had to hold back when I had to put down some guppies due to a bad case of nematodes. Aw, Civanna - I am so very sorry for your loss! Cleopatra was such a beautiful girl!!! Like Punkin said, more compassion like that would make the world a better place indeed! My opinion? There's something sadly wrong with a person who does NOT feel any grief at losing a pet, no matter if it's a fish, a dog, a lizard or whatever. I think it's the most normal human reaction possible, to cry & grieve over losing "anyone" you care about - regardless what species that "someone" might be. ((hugs to you))!!!! I don't think that its lame, I burry my fish in my plants so they can live on as a plant. ^^ its a good way to remember them. No way is it lame. Anyone who says that to you just doesn't understand fish. I love my betta a lot, and can't imagine the day he dies. I don't think that it is ridiculous because I feel like I have a very good bond with Neptune. I agree with all the posts above, I love fish and they have their own little personality. It isn't and will never be lame to be broken up about a loss, I'm very upset whenever I lose a fish (May even be some non-family-friendly words floating about, very guilty of that). Especially if its some fish or animal that I really cared about (For instance my 2 Quaker Parrots, my Swordtail, my Australian Rainbowfish, my dog when I found out she had arthritis in her leg and many other pets). Just one of the very unfortunate things about life, nothing won't die (Except Lobsters and cockroaches, those things just will not die, except to a good roast, don't really like Seafood). Its your way of reassuring yourself that you really cared for that animal, and that he probably cared for you. My pets (Dogs, Cats, Fish, other pets, ect.) I hold very dear to, and am very broken up about when they pass. Just don't forget them, that's one way to keep them alive, at least to you. Very sorry about your loss, I've never had Goldfish before but hear some good things about them. Thank you so much, you're so sweet. I have to pretend it's not a big deal because I think everyone would think I'm being ridiculous. I thought I could grieve on here instead. I'm still very upset and I miss her loads. She was my little baby and I was so excited to see her grow & get big. She only lasted 5 months with me and that makes me feel so GUILTY as she might have had a longer life with someone else. I got her last year when I was in a bad place and she really cheered me up. Now she's gone and it's just really lol. I don't think it's lame. When I was in high school, my biology teacher had about 4 tanks in her classroom. My friends and I had a funeral every time a fish died. Like actual procession from our homeroom to the biology lab. Complete with full program, hymns, and a gravestone made out of paper on my computer. That.... That might have been lame. But there's nothing wrong with grieving over a loved pet. Hahaha! This made me laugh, thank you!